More than half of all commercial and industrial buildings operate at less than 60% efficiency. Global Mechanical shows you how to slash costs with an energy efficient and sustainable building. Our team of Commercial HVAC Super Heroes are ready to take care of whatever your building is demanding for attention; 24/7. The comfort of your people is number 1! Planned Maintenance, Emergency Response, and Multi-Trade Service Construction Service. Full-service Engineering, Design Services, and Commissioning. We take care of the details including Building Inspections and permits. 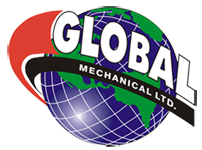 Global Mechanical delivers peace-of-mind with experienced recommendations and thorough Maintenance Plans. Our technicians are certified and current on industry trades. Our dispatchers are expert coordinators and our project managers are professional and experienced. We provide the service contractor of choice to our customers. Servicing Retail, Office, Warehouse, Automotive, and Public buildings.